The Kelly Autism Program at WKU recently honored businesses, organizations and individuals within the WKU and Bowling Green communities who have contributed to KAP’s success. The 8th Annual Alliance Awards were presented at the Downing University Center. Support from such organizations and individuals ensure the success of KAP and the participants served, KAP Director Marty Boman said. The following received Alliance Awards: Bowling Green Parks and Recreation, Bowling Green Warren County Humane Society, Bowling Green Hot Rods, Community Action of Southern Kentucky, Griff’s Deli, Home Towne Suites, Kiwanis, Modern Woodmen of America, The WKU Center for Gifted Studies and WKU Campus Childcare. Greenview Hospital and Community Action were given the Friends of KAP Award for their support during the United Way Day of Caring. KAP also presented scholarships to the following WKU students: Andrew Staggs of Goshen, Curtis Spratte-Lenington of Goshen and Zachary Pennington of Lexington. These students were rewarded for earning a 4.0 grade-point average while at WKU. 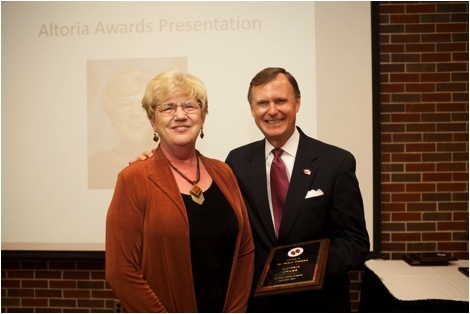 WKU President Gary Ransdell presents the Altoria Award to Dr. Robyn Swanson. Each year KAP awards the Altoria Award to an individual who has supported KAP to the highest degree. This year the award went to WKU Music Professor Robyn Swanson, who designed a music and movement curriculum that meets state, national and 21st Century Standards. Dr. Swanson not only created the curriculum for KAP but also supplied KAP with the materials and training needed to implement the program. KAP is designed to provide services to adolescents and young adults diagnosed along the Autism Spectrum Continuum, as well as their families, while serving as a training opportunity for future professionals in a variety of disciplines. KAP has programs for middle school, high school and post-secondary participants including higher education, vocational training and job support. Contact: Marty Boman, (270) 745-8833.